With the days getting longer and temperatures rising, the impending summer season means music festivals and leisurely nights spent outdoors. 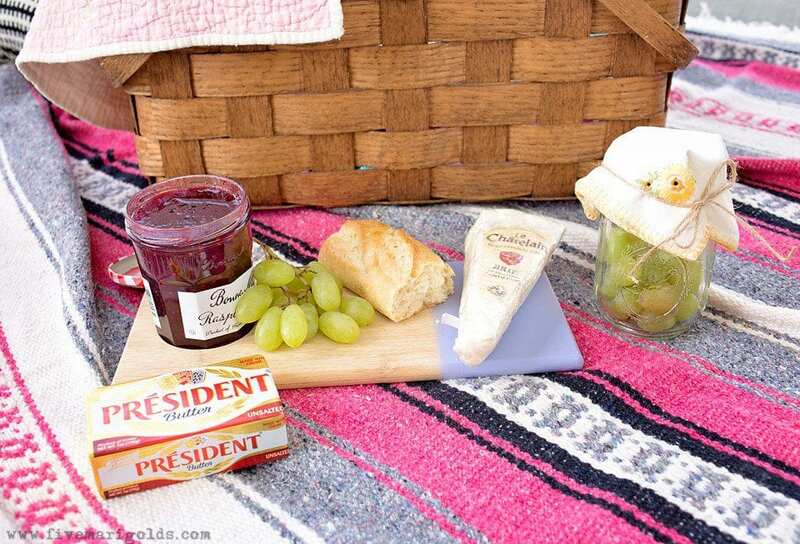 Today I’m sharing 5 ways to beat the heat with a perfectly chill summer picnic. First, of course, start with the essentials. If you’re meeting with friends, a good rule of thumb is to pack a bottle per 2-3 people. 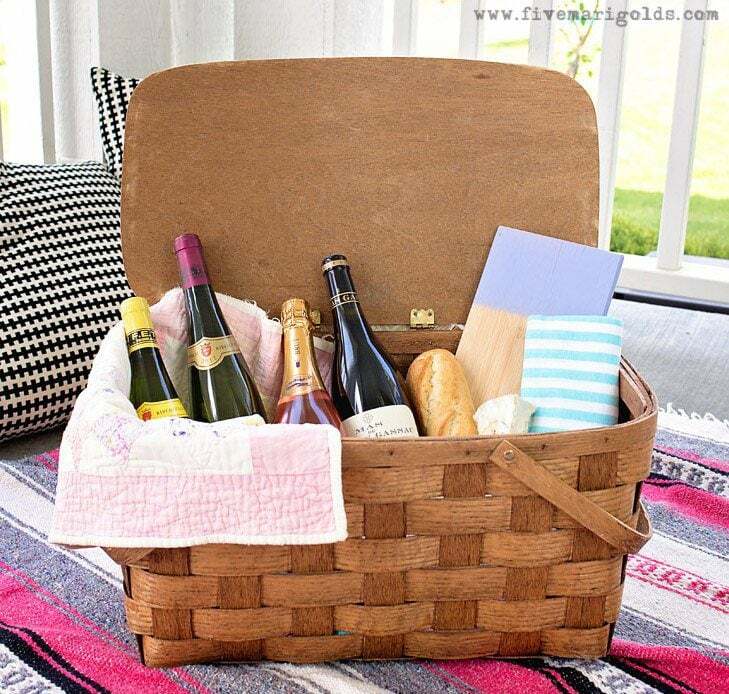 Pack a selection to suit a number of tastes: a white, a red, a blush and a sparkling. 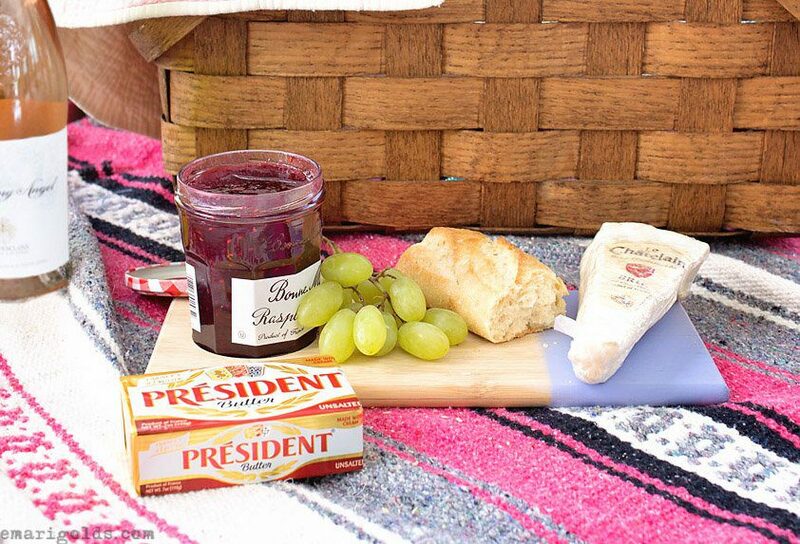 If your outing isn’t a full meal, pack fruit, bread, crackers, and a variety of spreads, like jam, butter and brie. 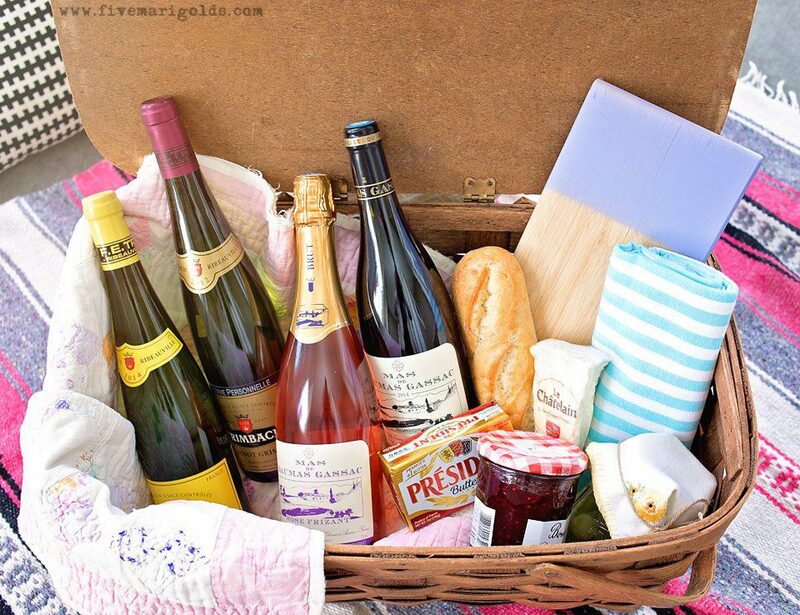 You may notice a theme in my basket – all the wines, cheese and butter are from France. Everyone knows that France is the place to source wines and cheeses, but that doesn’t mean these delicacies will break the bank. I mean, have you ever tasted French butter? It’s so different from what you’d get at the grocery. It’s so creamy and flavorful. I’m actually not sure I can go back! And, that French Brie! Again, so creamy and rich. Now on to the wine. Frozen Grapes – This is a simple way to cool down your favorite wine without watering it down. I especially like to do this with red wine. Just pop your red grapes in the freezer and pop them in your favorite red wine to serve. Enjoy your grapes as a post drink treat! I tried this in the Mas de Daumas Gassac red 2015. 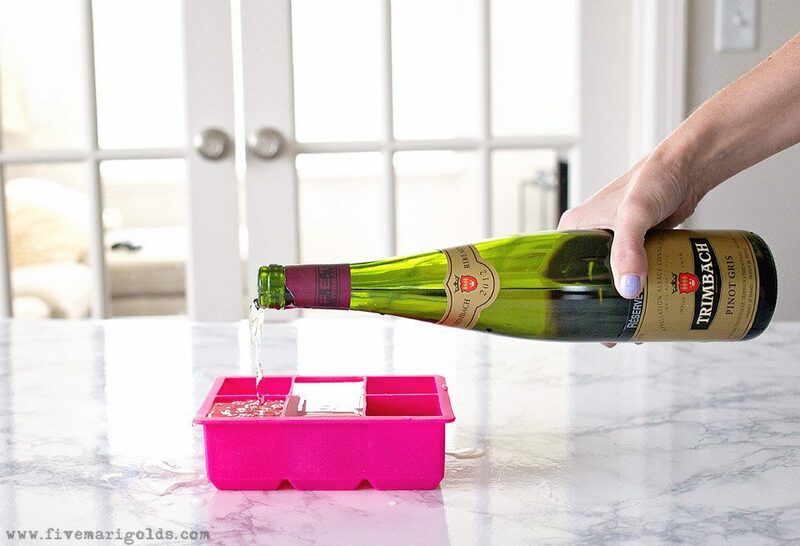 Wine Cubes – It’s true that alcohol won’t freeze into a completely solid state, but wine freezes just enough to hold the cube shape, especially when using a silicone ice cube mold. This is a fantastic way to use leftover wine – just pop it into your next glass of wine or use it for cooking. Shown here: Trimbach Pinot Gris Reserve 2013. 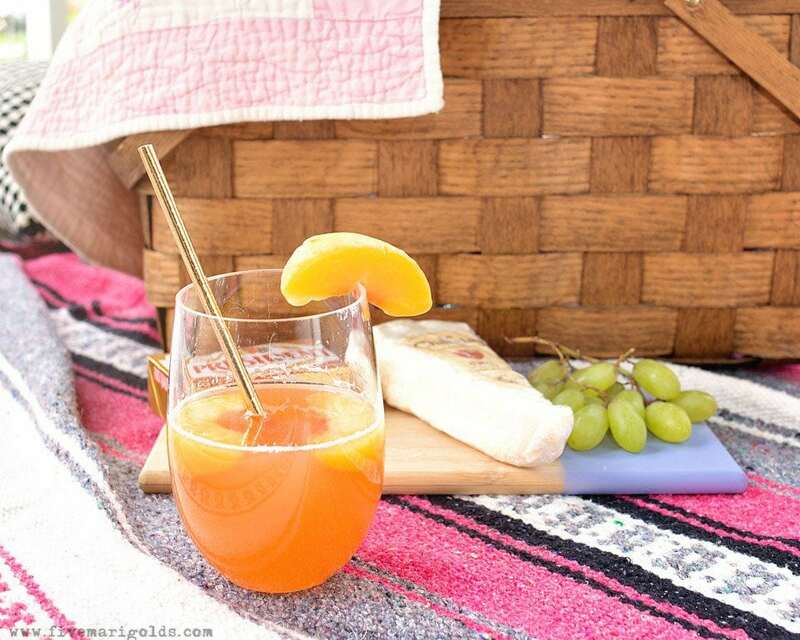 Frozen Peach Spritzer – Whether you serve it blended or gently stirred, this fresh and fruity drink is sure to please! 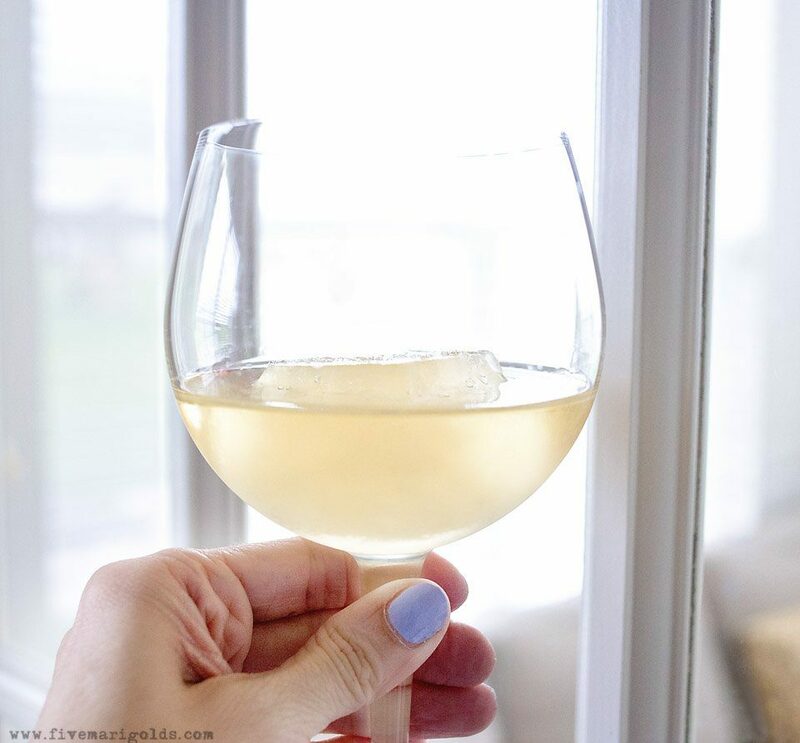 Just mix 1 C. of your favorite white wine – I used Trimbach Riesling 2014 for its sweet flavor – and 4-6 frozen peach slices. Process together in the blender before adding 1/2 C. seltzer or lemon lime soda. If desired, skip the blender and substitute the frozenpeaches for fresh juice. Add a frozen peach or two to garnish and help keep it cool! 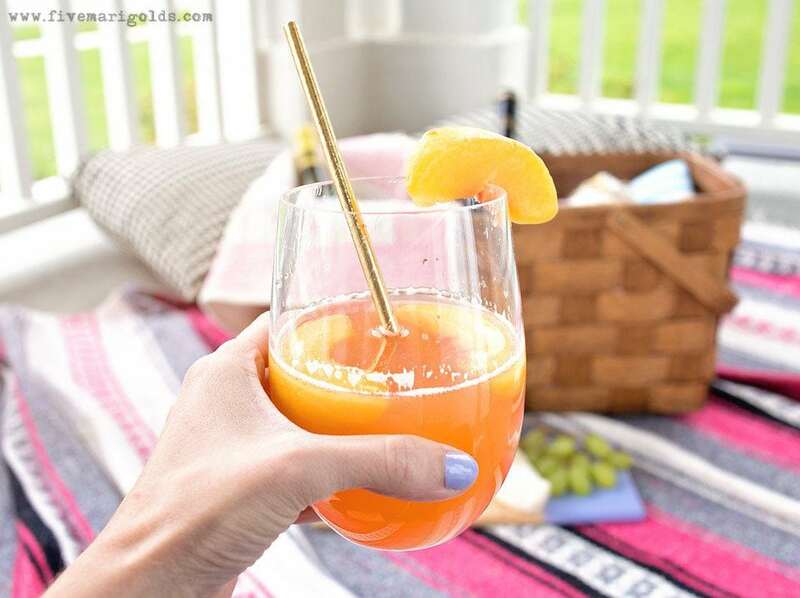 Frozen Mimosa – Champagne is always great on its own, but I especially love a good mimosa. 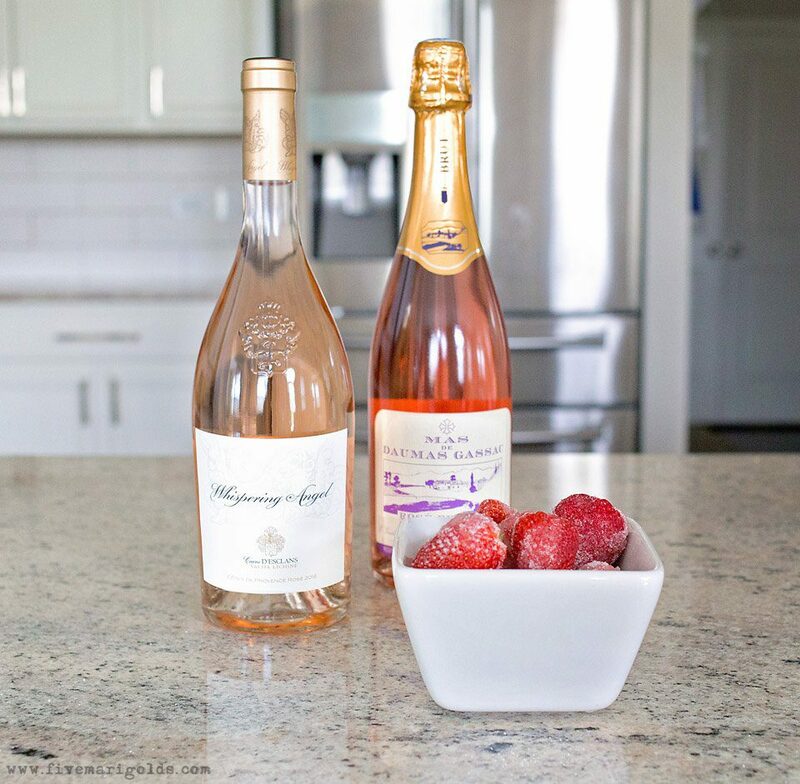 For a twist on the traditional, freeze your juice of choice into ice cubes for your next glass of sparkling Rosé. Or, even better, drop in small scoop of frozen sorbet. I whipped my my latest batch of mimosas using Mas de Daumas Gassac Rosé Frizant 2016, and it was ah-mazing. Drunken Berries – I’m obsessed with these. Ob-sessed. Just soak your favorite berries in Rosé (I used Château D’Esclans, Whispering Angel Rosé). After a few hours, remove the berries from the wine and pat try. Toss with sugar and serve. These are ridiculously good. As in, you MUST try these. Oh! And don’t toss out that wine you soaked the berries in – you’ll love the flavor of your berry-infused wine. What is your favorite kind of wine? I’d love to hear your favorite wine and chilling techniques in the comments below. That spritzer sounds delicious! Perfect to make for parties! Everything looks sooooo good! I need it all right now!! I love me some good wine and I LOVE this post! I am all about some frozen grapes, but I have never done wine cubes before. Will have to give them a try! And drunken berries?! Yum! I love this post so much! I love chardonnay! I try to just keep it chilled in fridge or in cooler, but I LOVE the frozen fruit idea, so easy! beautful photos! I have been known to put regular ice in my wine! HAHA. Your frozen peach spritzer sounds so refreshing. Amazing tips, I already tried the frozen grapes one and it’s pretty good. Will try all the others during this season! I love the idea of frozen grapes! I want to try that!